Washington State University researchers have developed a way to grow algae more efficiently maturing in days instead of weeks. The development makes algae more viable for several industries, including biofuels. The team’s research has been published in the journal Algal Research. 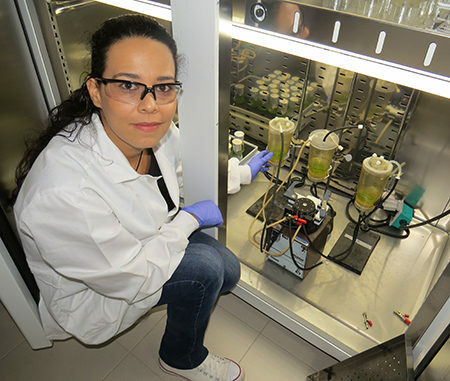 Washington State University graduate student Sandra Rincon helped develop a faster, more efficient technique for growing algae that can be used for biofuels. Image Credit: Washington State University. Click image for the largest view. The research was led by graduate student Sandra Rincon and her advisor, Haluk Beyenal, professor in the Gene and Linda Voiland School of Chemical Engineering and Bioengineering, the researchers developed a unique biofilm reactor that recycles gasses and uses less water and lower light than typical reactors. This is a biological raw material breakout for algae. Algae always has had very high potential, and looks really attractive with oil over $120 a barrel. Ms Rincon’s work is sure to drive the competitive oil price needed down. If its far enough, only more work will give the clues. Hopefully the team will update as their work progresses. Algae: It’s what’s for dinner! They may have unknowingly just created a major part of the food chain for a Moon based or Mars Colony.